Tacinga, aka Slatex Tacinga, is a 2-year-old red female born April 2, 2012. Her sire is Flying Hydrogen and her dam is Slatex Eva. 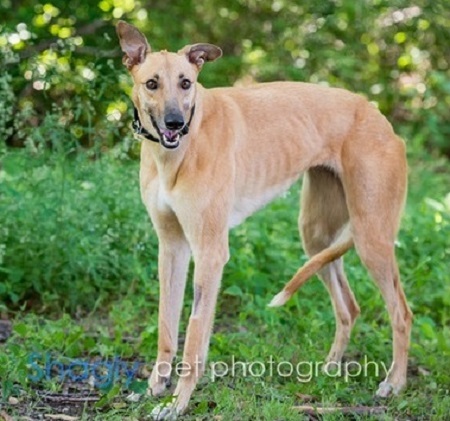 She has no races on record at Greyhound-data.com, as she's a little shy and just didn't want to run. Tacinga is a type of cactus, but you're not going to find this girl prickly at all. Tacinga has passed an initial cat test and has spent time with cats in a foster home. In the short time I have had Tacinga I have watched her get over her shyness a little each day. When she went to her first meet and greet she cowered in the back of my car and didn't want to get out. Now she will readily jump in and out of the car. She will come to me when I call her if I get down on her level. She has not had any accidents in the house and knows that she is to go potty outside. Her biggest vice is eating Kleenex and toilet paper, so I do try to keep those items out of reach. Her chosen "safe place" to nap seems to be in my master bathroom with her feet up on the side of the tub. But during the night she will come out and sleep on the dog bed in my bedroom with everyone else. 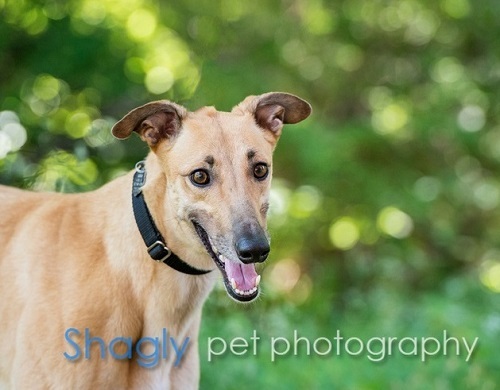 She is getting along well with my other greyhounds. She will come up to me and receive ears scratches and in return I get lots of wonderful kisses. Unfortunately she is still to shy to give people kisses at meet and greets. She just needs a little time and patience. She has discovered the joys of playing with stuffed toys in the house and she also likes tennis balls. She was initially crated while I was away during the day, but she now has run of the house when I'm gone. She's fine either way. She spends most of her day sleeping, modeling usual greyhound behavior. This little girl has so much love to share! She just needs time and understanding for her beautiful personality to blossom for you.